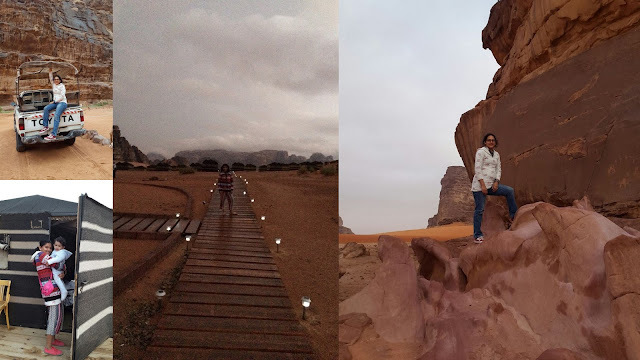 A maze of monolithic landscapes; The steep inclines of the mountains amidst the red sands; Crevice-riddled cliffs; Ever evolving light; Cozy marquee tents; Trudging camels; Few hulking red dunes; Bumpy jeep rides; Tranquility in the boundless empty spaces; Puffy clouds, inspire a unbridled awe. Jordan's desert is simply called the "Valley Of The moon". The name "Rum" comes from Arabic rooted word meaning "highly elevated". To stress on Arabic pronunciation, it is often called as "Ramm". And if you want to pronounce Jordan the Arabic way it is very cute, "Jor - dan - dan as in then-". The highest elevation in Wadi Rum is recorded to be as tall as 6000 feet plus. Exploring the canyons and the numerous "jebels" (mountains are called jebels in Arabic) is quite an experience in the jeep rides of about 4-5 hours. However few trekkers here and there are a rare scene too. Spotted black tents is the camp area. With well facilitated King Size rooms. Historically renowned as UNESCO Heritage site, Wadi Rum sees remains of rock paintings, symbols, small temples and things related. Mostly inherited from Nabatean culture. Nabateans are the ancient Greek nomad tribes that inhabited the Arabian deserts.These rock art and graffiti are the testimonials of the human habitats and their cultural facts. Getting lost in the desert is just easy. Even your echo would be lost in few seconds. You remember that tiny ant you watch in your backyard when you walk past the humongous desert alps. You are like a speck of a dot under the blue carpet and over the red, in middle of valley of granite rock. The spectacular series of mountains, the natural arches, the dramatic weather, sky scraping cliffs are evidence of the complete aesthetic values of the iconic desert. Much said is less and words cease the unique experience of my being present there in the winter days and a rainy night. Several hollywoord and bollywood movie shootings have been a fancy in this wadi and one of our Hindi popular being the Krish 3. The Bedouin (The local dwellers belong to a tribe called Bedouin) walk long marathons in the desert along with their camels. Not always are the beasts burdened, but for fancy rides for the travelers. Few irregular tents set up by these locals traders in the middle of mountains will sell you exotic attar, mascara and other beauty products that are made of natural ingredients. So a good customer also gets the luxury of a complimentary Sulaimani Tea that you could make yourself (Arabic tea Sulaimani is strong version of our black, masala tea). Also one can get to experience trying their traditional attire or at least the keffieah (turban) and feel like an Bedouin. A perfect "Sholay" set up of the caravan for the night camping. Cozy tents which are more or less a three star facilitated one. What more would fascinate you, but even Wifi in the rainy night in the desert! 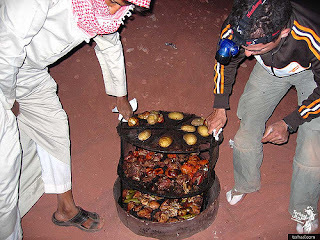 Talk of food and the non vegetarians would just love the traditional food cooked in the tents that is called "Zarb". It's the Bedouin's traditional food cooked underground with meat, rice and chicken. Yes underground! A hole is dug, big enough to fit in the metal multilayered tray. Next, the natural oven is heated with fire for a while till red hot. The metallic tray decked with vegetables, meat and rice is then placed in the hole and cooked for over two hours before one can devour the delicacy. I could forget the taste of coal over my food that I barbecue in my backyard. The zarb is a amazing tongue tickler. Ask me, and what an jaw dropping experience it was. Winter air tickling your spine, and occasionally you give out the Govinda shakes even with your 2 inch thick jackets on. An unusual experience of feeling the rain did not let us sleep. With mixed feeling of thrill as well as new fear we laughed if we were sleeping in a fabric made cold box in middle of sand heap. However the following morning saw one of the most beautiful dawn we could ever dream of. With blue castles of clouds dancing right over the mountains, we drove for hours in open Jeeps in the desert. Experiencing the nature's vivid colours at best. A trip worth taking that will mesmerize you with it's amazing heritage facts added to all other factors. The only non alcoholic rum made of nature that can actually intoxicate you! Say absolute no to the summer (March till August) travel. October and later is best time to camp in the desert. Be prepared for unexpected rains in winter though. Don't forget your sneakers and warm attire. 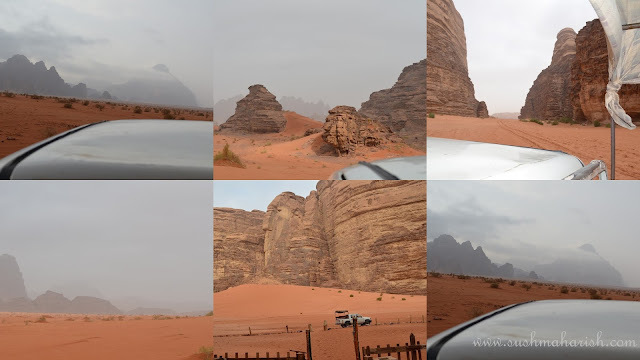 Arrive at Wadi Rum few hours before sunset. Keep the Jeep ride desert exploring for the morning. Hot air balloon rides, camels rides are offered in the camps you chose. And if you do take tips from post, please link it whenever you post any travelogue or pictures of yours! can imagine what a wonderful travel experience this must have been! the narration and the photos complement each other beautifully.